We are Central Mountains’s most gentle and complete wildlife service! 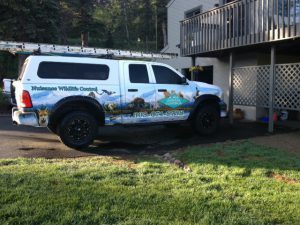 Locally owned and operated in Evergreen, CO.
A All Animal Control is your local wildlife experts and are commonly called upon to control Badger, Bats, Birds, Beaver, Bull Snakes, Cats, Coyotes, Chimney Swifts, Chipmunks, Flying Squirrels, Fox Squirrels, Fox, Geese, Groundhogs, Mice, Moles, Muskrat, Pigeons, Prairie Dogs, Rabbits, Raccoons, Rattlesnakes, Rats, Rock Squirrels, Snakes, Squirrels, Sparrows, Starlings, Turtles and Woodpeckers. Proudly serving the counties of Jefferson, Park and Summit, Grand, Jackson, Clear Creek, and Gilpin Colorado and surrounding communities. We also service the city, cities and towns of Breckenridge, Dillon, Frisco, Heeney, Keystone, Montezuma, Silverthorne, Black Hawk, Central City, Cottonwood, East Portal, Lincoln Hills, Nevadaville, Nugget, Pactolus, Pinecliffe, Rollinsville, Russell, Gulch, Smith Hill, Tolland, Alice, Argo Mill, Bakerville, Berthoud Falls, Black Eagle Mill, Blue Valley, Brookvale, Downieville, Dumont, Empire, Freeland, Georgetown, Gilson Gulch, Graymont, Idaho Springs, Lamartine, Lawson, Saint Marys, Silver Plume, Evergreen, Indian Hills, Conifer, Pine, Bailey, Fairplay, Nederland, Frazier, Winter Park, Como, Jefferson, Grant, Shawnee, Aspen Park. A All Animal Control services the following area zip codes and will fully resolve your wildlife problem! The county or counties that A All Animal Control services are Clear Creek, Gilpin, Grand, Jefferson, Park and Summit counties. 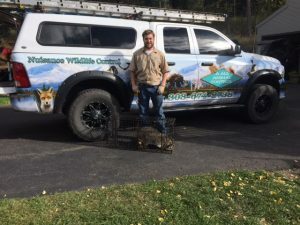 A All Animal Control, a Nuisance Wildlife Management company is a leader in providing wildlife, animal and pest control services for residential, industrial and commercial clients in the Central Mountains of Colorado and surrounding communities. We can handle any wildlife control problem from mice to bats and provide incredible service while using the latest technology and equipment. To control wildlife requires a qualified and experienced expert to assure you of expert care of your wildlife problem. Don’t confuse the modern day nuisance wildlife control professional with the old time animal trapper or animal pest trapper. Your wildlife expert has been specially trained in the control of wildlife specific to Central Mountains in Colorado and will take care of the problem in the most gentle and humane way possible. All wildlife experts of A All Animal Control undergo a rigorous training program for wildlife control in order to give you the most efficient and cost effective solution to your problem. Their wildlife professionals are licensed and insured for your protection and comply with all laws regarding wildlife control. A wildlife expert is just a phone call away and can often assist with your Central Mountains of Colorado, CO wildlife control needs the very same day. Call us at 303-674-2738 to put an end to that annoying wildlife problem and control damage wildlife causes. Beware of companies that are not licensed and insured or charge a ridiculously low price for wildlife control. These are red flags that the company is not qualified, insured or licensed. If they damage your property or become injured on your property, you may be held liable! A raccoon, snake, opossum, groundhog or cat in a cellar can destroy the insulation and leave disease infested waste behind. An animal in a cellar may also enter the home and put the occupants at risk of being bitten. A raccoon or opossum entering through a cat or pet door is another service that we can provide. We will capture that animal and recommend a better solution to your pet needs. Services are provided for deceased and or dead pet and dead animal removal. Bird and pigeon control are services we provide through installing bird spikes, bird netting and bird exclusion. Pigeon trapping using pigeon traps and mist netting is also available. A mist net is a fine mesh net used to capture smaller birds such as birds in a store. Companies like Orkin and Terminix control insects. If you need a professional to control your wildlife problem, our specially trained technicians will quickly resolve the situation. If you are experiencing a problem with any of these animals and you need a pest control specialist and professional solution from a pest management company, call the animal experts at A All Animal Control. Wildlife trapping is an important part of wildlife removal services and providing environmentally safe ways to control wildlife is important for their protection. By hiring an ADC, Animal Damage Control, Animal Damage Control Agent, MAPAC, Problem Animal Controller, NWCO, Nuisance Wildlife Control Operator, Wildlife Management Experts, Wildlife Management Professional. Certified Wildlife Professional or Wildlife Management Pro, you ensure a professional will be controlling, removing and will get rid of or eliminate the wildlife problem and find the best wildlife solution for the animals that are affecting you. A qualified and trained technician will provide an affordable wildlife control service to fit your needs and situation. Extermination services are provided in your local area as well as the metropolitan. 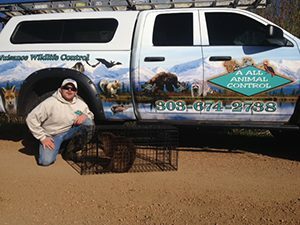 Central Mountains of Colorado squirrel and raccoon removal and control are services that we provide daily as well as bat, snake, groundhog and opossum control and removal. A wild critter pest must be controlled using the proper elimination, eradication or critter capture techniques. In most cases we can relocate the wild animal and do not have to kill it. There are occasions when the animal must be exterminated by wild animal services. In such cases, we use proper extermination techniques recommended by the American Veterinary Medical Association or AVMA. The use of a moth ball or other repellants often fails during the removal process and is not a legal repellant for wildlife. We often find moth balls in the attic or crawl space in use to cover a dead animal odor or smell and the owner is trying to use them as an animal remover product. Dead animal removal and odor control are services we offer for such unpleasant situations in addition to animal exterminating. If you find a tunnel, mound, run or mole holes, this is evidence that moles are actively working the yard creating this damage. Gopher traps are the preferred control method to remove Gophers and return your lawn to its pristine condition. By far, the best method is to use a cage, box trap or other similar animal capture device for trapping. Our nuisance wildlife companies use only the best equipment designed for the project they are working on. A professional knows how to catch and release the captive animal. Once caught, they must abide by their local wildlife laws. When the animal problem has been removed, proofing, exclusion, repairs and reclamation work can begin. TAP or T.A.P (Thermal Acoustical Insulation) can also be applied by our licensed offices to serve as a deterrent against insect pests. A All Animal Control technicians are trained and equipped to clean up all waste, hazardous waste, guano, droppings, feces, urine and poop. A thorough cleaning is important to protect your family from diseases. To make your home safe and secure, our highly skilled repair experts can install insulation screening, screen chimney, cap chimney and repair siding. Our wildlife experts can also perform wildlife damage repair. Wildlife damage inspections are another service provided for property managers, real estate agents, building owners as well as the seller or buyer of a home or commercial building. Wildlife exclusion is performed for insurance companies in additional to confirm damage claims for wildlife. Repairs are warranted for your protection and decontamination services also available. A All Animal Control ensures professional wildlife control for noises in an attic such as a raccoon, squirrel or bat colony. A pest management company will locate the source of the infestation and resolve it quickly. The removal of an animal in wall is another custom and expedient procedure provided by A All Animal Control for many species in private residences and commercial properties. Pest control companies specialize in insect pests. Ensure your protecting by having a professional exterminator of wildlife resolve your wildlife conflict. Our animal trappers perform full inspections and would be happy to set up an appointment at your convenience. Prevent diseases such as distemper, rabies, hantavirus and histoplasmosis by removing dangerous and potentially diseased and rabid wildlife. Raccoon, and Squirrel removal from a crawlspace or attic is a common problem in the Central Mountains of Colorado area. We can remove a Raccoon and Opossum and Possum from a crawlspace quickly and repair the damage to your crawlspace. We will also install a new crawlspace door to prevent any future problems. Animal rescue and wildlife animal rescue are specialty services that only a professional can provide. An extension service does not provide live trapping for feral animals or provide live trapping, live catch, animal proofing or nuisance animal pest control services. Catching animals or rodents in a crawl space, gutter, or vent are other services pest control companies provide. A pest control contractor can trap an animal and provide local pest control as well as wild animal control.